Want to upgrade your 2.5-inch laptop and Notebook hard drive? 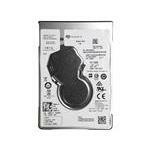 At Memory4less.com, we have an extensive range of internal 2.5-inch Notebook hard disk drive for upgrading computers and portable devices. Our collection encompasses everything you may need, ranging from 250GB hard drives for aged laptops to 10TB hard disk drives for latest Notebooks and Laptops. While choosing 2.5 inch internal hard drive, you should look at the storage size. HDDs size depends on its usage. The type of Laptop hard drive that will best suit your needs depends on your interests. Our preference is that if you use Laptops and Notebooks for program-intensive or data-driven tasks, anything above 1TB will serve you better. However, for daily use, anything between 250 GB and 500 GB hard drives is a good option. The Laptop hard drives run at 5400RPM. They have SATA connector and a data transfer rate of 6Gbps. If you are unsure about what type of laptop hard disk drive to buy, feel free to consult one of the laptop hard drive experts at Memory4less.com. Browse our huge catalog of upgradeable laptop hard drives to order one today. Buy 2.5-inch Notebook hard drives on a budget for homes and enterprises. Get in touch today!